Jackson police continue to look for a man who robbed the Bank of Jackson Hole in Powderhorn Mall about 9:45 Monday morning. According to Police Lt. Roger Schultz, the man entered the bank and presented a note demanding money. He did not show a weapon to back up his demand. The man then left with an undisclosed amount of money from a single teller cash drawer. 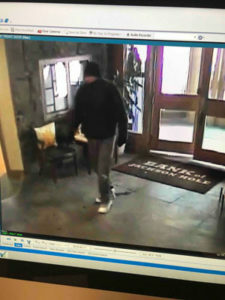 The man is described as approximately 6 feet tall, wearing a black beanie and dark coat. Lt. Schultz advises that if members of the public see someone matching this person’s description, they should not approach him, but notify the dispatch office at 733-2331 immediately.